You’re a stranded astronaut’s only hope—and you can only communicate through text messages. A U.S. space shuttle inexplicably crashes on a moon in a galaxy far, far away. One survivor—a science student named Taylor—has managed to get her communications device working, and she’s texting…well, you. Apparently, Taylor’s really trusting of some random stranger with an iPhone on Earth. 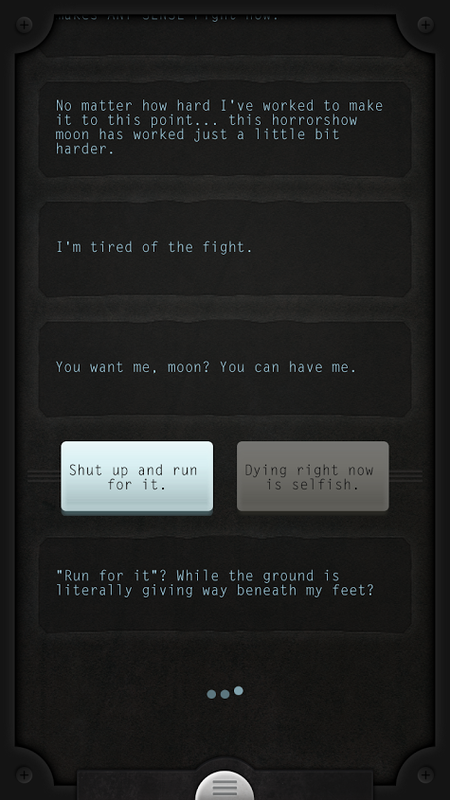 Lifeline is different (and I mean that in a good way) from the mobile games you’re used to. This choose-your-own-adventure game is all text—a running conversation between you and Taylor. Although the premise is simple, and the interface (all text with A/B choices for you to pick every so often) is very basic, this is not your usual interactive fiction game. In Lifeline, time is also a gameplay element: Taylor comes to you when she needs help, but when Taylor’s busy—say, walking to a peak that looks about an hour away—she turns off the communications device and you’re left waiting in the dark. You won’t rush through this game, picking out choices left and right to see if you guide Taylor down the correct path. You can’t, because Lifeline’s story plays out over the course of several days. The story is engaging: Interactive fiction isn’t always up my alley. But what doesn’t sound cool (and a little creepy) about Lifeline’s plot? Taylor, a science student (high school, I’m assuming, since AP classes are mentioned), is suddenly stranded on a desolate moon that circles a planet that’s nowhere near Earth. The story oscillates between the basic, mundane issues of moon-living (i.e. surviving the cold when the sun goes down) and the more interesting parts of exploring a celestial body (i.e. that strangely man-made-looking peak that hovers just over the horizon). Taylor’s not the bravest soul, so sometimes you need to give a little encouragement. Taylor’s voice gets a little needy at times, but I think that’s to be expected when you’re stuck on a rock, alone, a billion miles from Earth. And Taylor is convincingly real—real enough that you’ll find yourself completely engrossed in the storyline despite the lack of visuals. Innovative gameplay with a dramatic twist: Using time as a gameplay element is, quite frankly, genius. Not only does Taylor’s absence (and sudden reappearance) create a more convincing atmosphere, but the pauses in the game make for an incredibly dramatic story. Don’t get me wrong—the story was dramatic to begin with, but it’s all the more dramatic when you’re waiting on the edge of your seat for Taylor to get back to you about what she’s found in the wrecked ship. You know, like when your friend starts texting you a juicy story and then stops halfway through to watch a movie—that kind of drama. 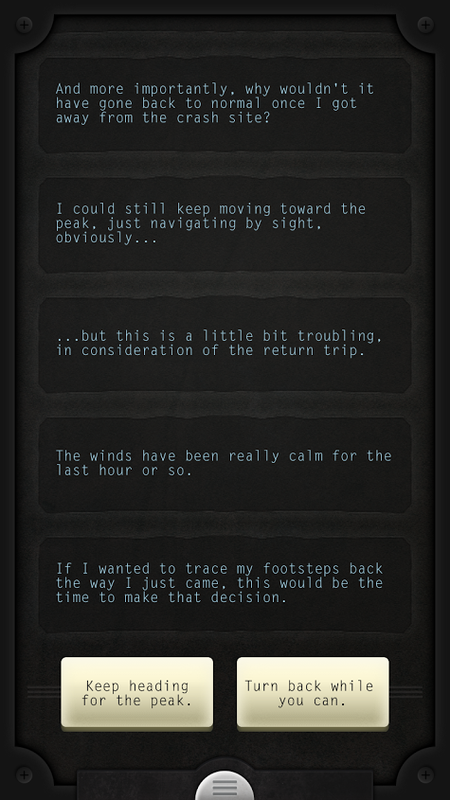 The time element definitely takes Lifeline from an average interactive story to an actual game. If you lead Taylor astray, and she, um, perishes, you can start over—and this time, you’ll have the option to play the game in “Fast Mode,” which means that Taylor’s absences won’t be in real-time. This option is for people who want to play through to where they made the wrong choice. Apple Watch compatibility: Lifeline also uses other gameplay elements, such as notifications—you’ll get notifications when Taylor texts you (if you don’t turn them off, that is). And if you have an Apple Watch, you can get these notifications right on your wrist, which makes for a pretty engaging experience. Lifeline on the Apple Watch isn’t particularly revolutionary, but you can play the entire game (admittedly, it’s a simple game) from your Watch, which makes you feel a bit more like you’re actually talking to this poor, stranded astronaut. Taylor texts you when she’s around, and responds when you “text” back (by choosing a pre-written answer), and even makes your Watch feel like it was worth the $350-plus you spent on it.